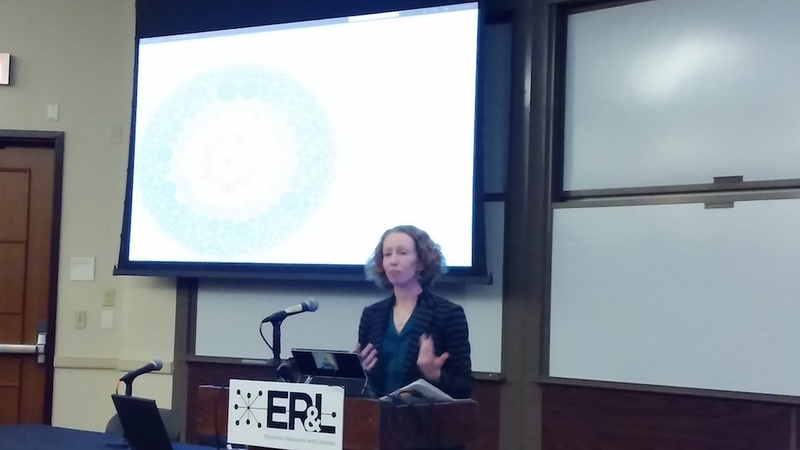 Altmetrics were a hot topic at this year’s Electronic Resources & Libraries meeting in Austin, appearing more than expected in talks throughout the conference. It was my first time attending ER&L, and I’m so glad I did! Here are my highlights from last week’s meeting. 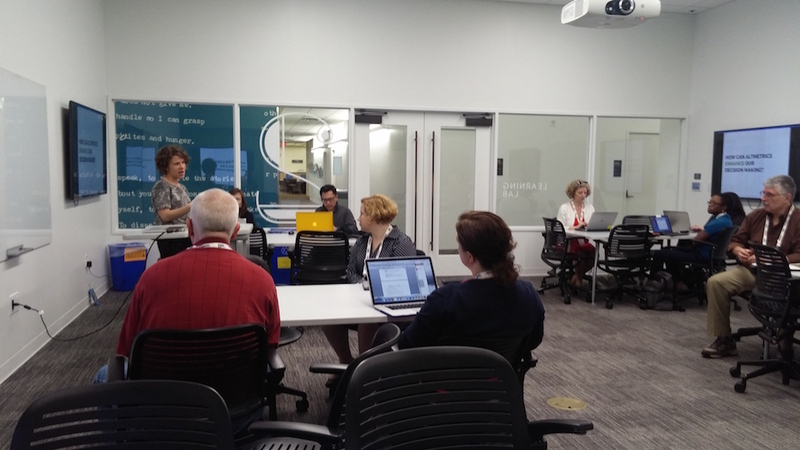 Along with Robin Champieux (OHSU) and a diverse group of librarians, I spent my Sunday afternoon deep-diving into the use of altmetrics, usage statistics, and data visualization tools to enhance collection management. In the workshop, Robin and I covered traditional collection evaluation methods (using usage statistics, journal impact factors, and faculty requests to drive collection management decisions) as well as new collection development possibilities powered by altmetrics. We have so much data at our fingertips now, which can help us move beyond how influential journals and ebooks are to scholars or how often research is simply read. Using altmetrics, we can now understand how research is being used online, and also discover very quickly what “trending” research looks like in all disciplines–information that can help us preemptively make purchasing decisions as these trends change over time. Particularly valuable to me was Robin’s talk, which described the nitty gritty of how collection decisions are made by her colleagues at OHSU. 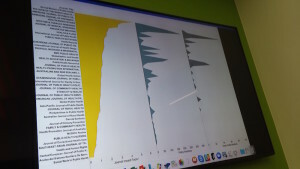 She led attendees through a fantastic data visualization exercise, where journal-level altmetrics data was compared with journal impact factors using data visualization techniques that are accessible to any librarian using Tableau. 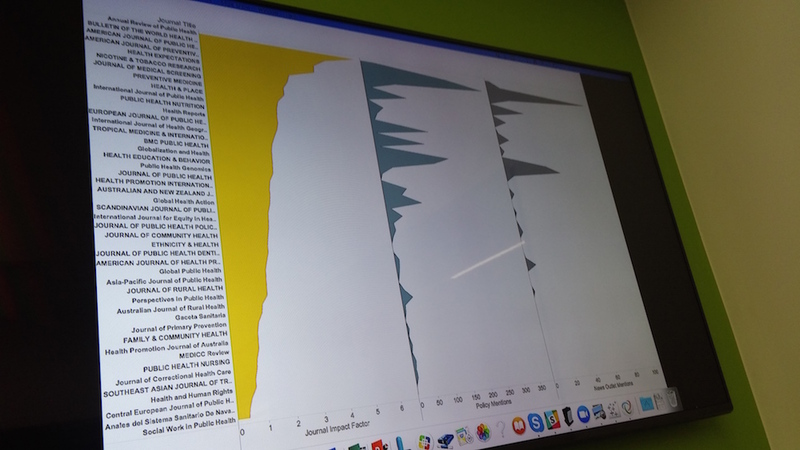 All of the visualizations tackled during the workshop featured data easily accessible to most librarians: Journal Citation Report data, journal usage statistics, and Altmetric data (which can be found using the Librarian version of Altmetric Explorer). Check out our workshop slides on the ER&L 2016 Sched.org site to learn more. Another presentation that gave insights into the use of altmetrics for collection development was offered by a team of librarians from Columbia University and the Mt. Sinai Icahn School of Medicine. 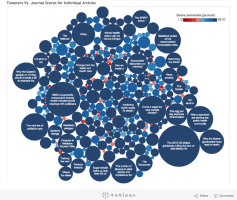 Metrics like journal-level usage statistics (often provided by COUNTER-compliant publishers) and cost-per-use were examined alongside aggregated, journal-level Altmetric scores to understand how different types of resources garner different types of attention, and thus may each have differing values to an organization like a medical school. I had the pleasure of presenting on another aspect of a study I’ve been working on with Sarah Sutton (Emporia State University) and Rachel Miles (Kansas State University), one that surveyed librarians and library and information science faculty on their understanding and use of altmetrics in their day-to-day jobs. 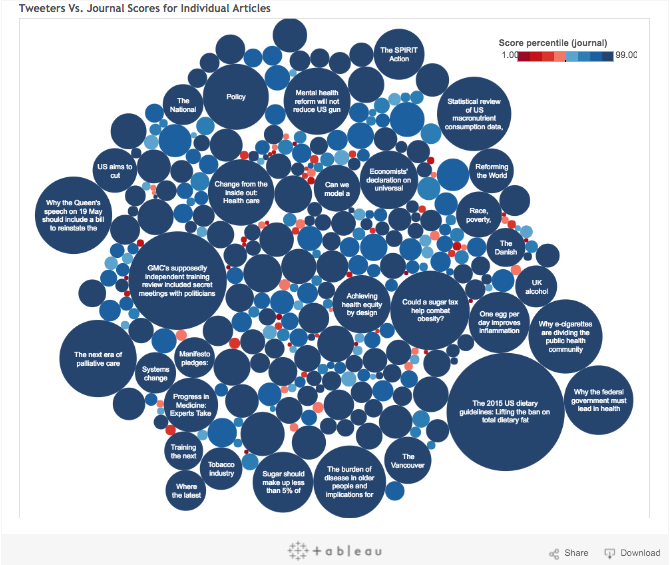 Librarians are more comfortable with altmetrics than information scientists–that’s remarkable, considering that many information scientists study scientometrics for a living! Both librarians and faculty who are on the tenure track are more likely to be aware of altmetrics than those who’ve already gotten tenure. That’s probably because they’ve got a good incentive to be paying attention! Over 40% of faculty on tenure track plan to use the journal impact factor to document the impact of their work, compared with just over 10% of librarians. 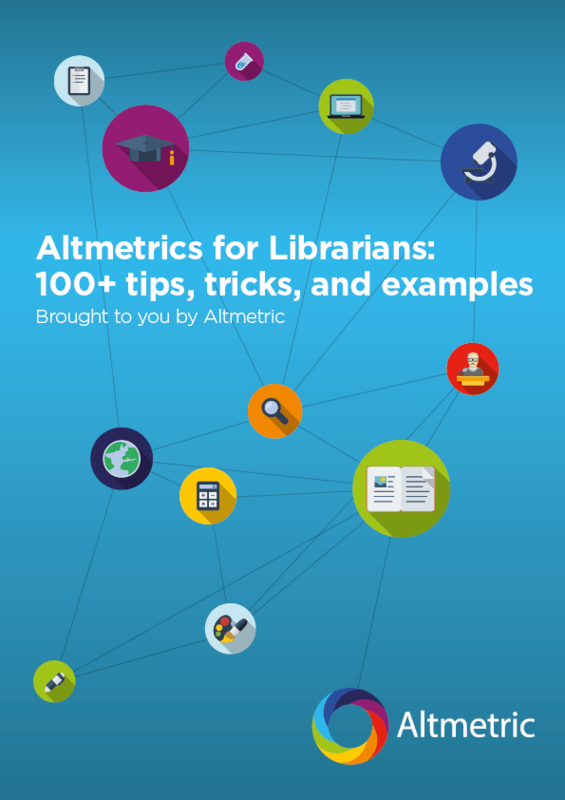 On the other hand, over 20% of librarians plan to use altmetrics, compared to just over 10% of faculty. Put another way, faculty are much more conservative with the metrics they plan to use to document their impacts than are librarians. Sarah and I will be presenting further insights from this study in a few months at QQML 2016 and NASIG 2016–stay tuned! In this talk, Andrea Cato, an Information Analyst at ExxonMobil Upstream Research Library, described how her team uses data visualization to understand publication and usage patterns of internally published technical reports. Cato shared a number of resources useful to beginners and experts alike (Informationisbeautiful.net and Storytelling with Data are two standouts), making this primer on data visualization a must-see for anyone with repository or collections responsibilities. Other highlights from ER&L 2016 included the Thomson Reuters session, “Research Metrics & the Evolving Role of the Library in Institutional and Faculty Assessment” (which prompted a thoughtful debate among audience members), “Data-Informed Decision Making for Digital Resources” (which shared a brief history of digital collections assessment tactics that have helped libraries showcase their value to funders and administrators), and “Assessing the User Experience of E-Books in Academic Libraries: Search, Usage, and Information Finding” (a user experience study that shed a lot of light on how database usability can seriously hinder patrons’ use of content). Presentation recordings are available (for a fee) on the ER&L 2016 site–check them out! I’ve come home from Austin with two important insights regarding altmetrics and usage statistics: 1) we now have evidence that a small but growing number of librarians are using altmetrics to evaluate journals for collection development. (In particular, they are using altmetrics sourced from us at Altmetric! That was nice to see.) Previously, we had only lots of editorials in library journals suggesting that altmetrics could be used in this way. 🙂 2) Though altmetrics are starting to be used for collection development, the reigning metric type used for collection management remains COUNTER-compliant usage statistics–they were mentioned in nearly all the presentations I attended throughout ER&L 2016. ER&L is a fantastic conference–I look forward to returning in the years to come!